Those responsible for fighting human trafficking in Durham have received an early Christmas present. The Ontario government is providing nearly $100,000 in funding to Durham Regional Police Service through its Civil Remedies Grant Program. The program is funded through the forfeiture of proceeds and instruments (such as buildings or cars) of criminal activity. The grants help programs aimed at supporting victims of these crimes. The $99,261 doled out locally is part of a total of $1.5 million in funding to be spread out across the province. The funding will help to purchase new, specialized investigative equipment to conduct investigations, as well as educational materials and training resources. 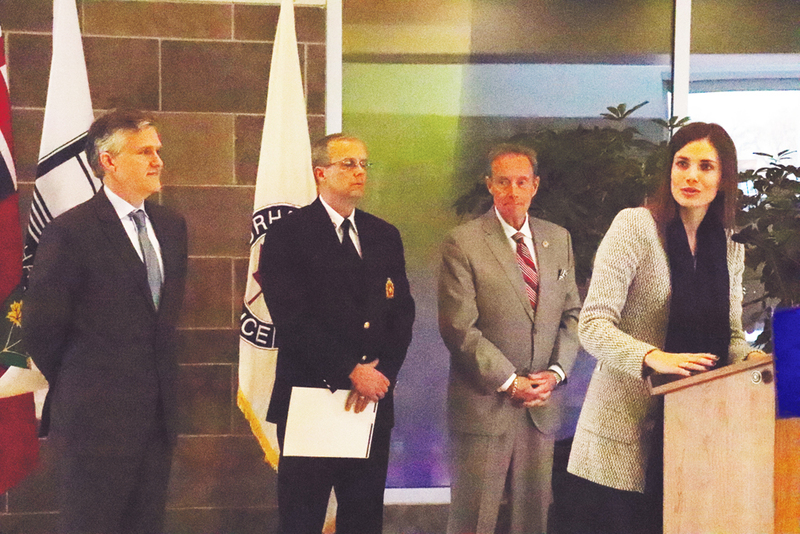 “The Durham Regional Police Service Human Trafficking Unit welcomes the financial assistance that this grant provides which will provide additional equipment and training to assist our investigators to combat human trafficking,” said D/Sgt. Ryan Connolly, head of the Human Trafficking Unit. “Our government is committed to empowering our police partners, and we really recognize the important role they play in keeping our communities safe,” Durham MPP Lindsey Park said. According to Park, DRPS’ Human Trafficking Unit has undertaken 80 investigations and laid more than 130 charges so far in 2018. But human trafficking is a crime that is under-reported, Park notes, and the impact is much more significant than can be reflected by reported cases. Park also praised the work of community organizations involved with the Durham Region Human Trafficking Coalition, such as YWCA Durham, Catholic Family Services, Carea Community Health Centre and The Denise House. The coalition is a group of approximately 30 agencies from across Durham that work together to help those impacted by human trafficking. In 2014, the DRPS unit was created not only to have officers focused on dealing directly with the investigation and capture of those committing the offences, but also to work towards the goal of educating and bringing awareness to the growing issue. Over the last three years, that education mandate has continued to grow. In 2017, DRPS officers conducted 55 public presentations and spoke with more than 2,600 Grade 9 girls across the region about the dangers and the warning signs of human trafficking.